I am currently training for the Vermont City Marathon in May. My long run this week called for a 14 mile run. My schedule was a little out of whack this week so I didn’t get my long run done on Friday like I should have and I was hoping not to have to push it to Sunday because I had other plans. Despite weather reports of impending doom and gloom this morning I saw sunshine! Sometime after 9:40 I hit the road and pounded out my 14 miles. I’m running slower than I would like. Some of that has to do with the viciously hilly routes I have been running and the winter road conditions. Some of it is probably from my lack of outdoor running this winterI selected a mostly flat route for my run today, but I was still really disappointed in my slower than usual splits as I was supposed to run miles 4-13 at marathon race pace. Nonetheless I was happy to be outdoors running with hints of sunshine along the way. I returned home shortly after noon just as it clouds covered the sky and rain began to fall. I quickly changed in preparation for the Road Race. Orlando was ready and waiting when I got home, a bit nervous for his first 10K. The race starts about a mile and a half from our house, but you have to cross a bridge to get to the start. The traffic is horrendous and parking is nearly impossible. The luck of the Irish was on our side and we found a great parking spot with little effort. It was still raining as we began our walk to the starting line, but it wasn’t pouring. As we joined the sea of nearly 6,000 runners with less than 15 minutes to start the clouds parted ways and the sun beamed over us. It was so spontaneous and unexpected people actually applauded. The temperature warmed to 60 degrees during the run and got almost uncomfortable. This wasn’t my best race. It definitely wasn’t a PR. I didn’t even beat last year’s Road Race time. It took me all afternoon to acknowledge the fact that I ran 20+ miles today and that is an accomplishment to be proud of. Not every race is going to be a PR. My husband had an awesome race. He tried to run with me, but I knew that was becoming an unnecessary challenge for him so I waved him on to go ahead of me. I never saw him again until after I crossed the finish line. He finished in 51:10 and I finished in 59:06. Every run is different. You can run the same loop at the same time two days in a row and feel like the queen of the world one day and the scum of the earth the next. It doesn’t say anything about you as a person — except that you’re normal. There’s something magical and indescribable about a comfortable pace and a good playlist. Running is all about you. You determine your own goals. For some, that’s a marathon. For others, it’s making it around the block. The best way to explore a new city or learn a new route is on foot. Sometimes the only thing holding you back is your own mind. You really don’t know what your body is capable of until you push it out of its comfort zone. Running does not necessarily promote weight loss. It is a really cheap form of therapy. I work a lot of things out during my runs. Everyone has the capability to become an athlete no matter what you were in high school. It’s so important to listen to your body. Don’t push yourself if you feel something is off, sore or painful. It’s better to take a few days off than to be forced to stop running for months. I’m also throwing in the next installment in the Love Your Body Challenge. This one was much easier and more positive than the last. Action Step: Take 5 minutes and write down a list of all of the things that you love that your body allows you to do. Write them down, and for each one, consider how you would feel if you couldn’t do that thing. Sit with that feeling for about 5 seconds, and then focus on the fact that you can. Allow yourself to be consumed with gratitude. I’m sorry that I’ve needed reminders to be thankful for this healthy body. It is the only one I have and it is up to me to treat it right. 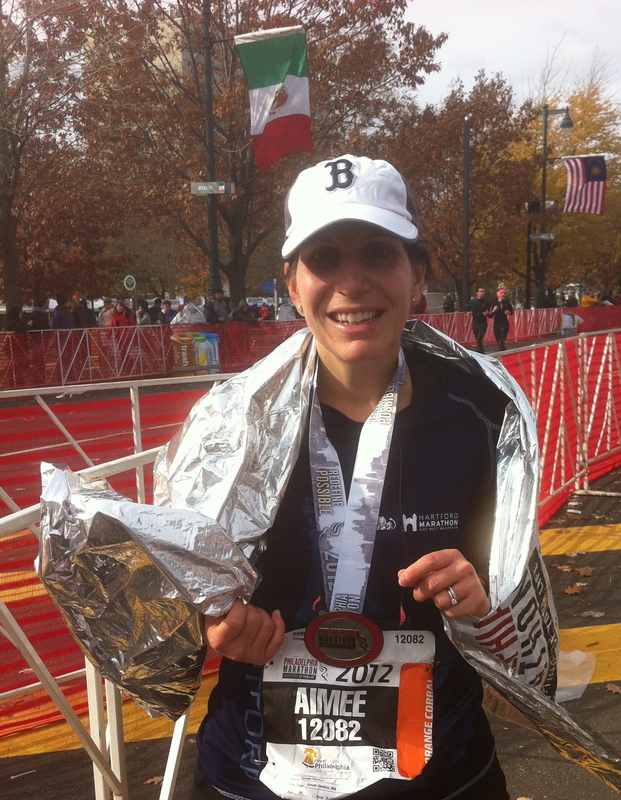 Congratulations on a great Road Race…ESPECIALLY after having run 14 miles BEFORE running it! I LOVED the lessons. I feel like they apply to walking too as that is what I mostly do…but there are times when I run/walk and I can truly attest to the wonderful feeling of freedom when you can run and feel like you could go on forever, when all is right with the world. I need more joy, so somehow I have to learn not to compare so much…easy to say, difficult to do! I think I may see you at work tonight? If not have a great night off. Thank you Kaye. And thank you for that quote. I’ve never heard it, but it so applicable to how I’ve felt. Jealousy and comparing myself to others are two qualities I’m working very hard to change. Glad you liked the list. I hadn’t even noticed the slideshow, I like the ones you chose. I cannot even begin to imagine running 20+ miles in one day – you are my hero! Holy shizz – Orlando’s time was great – and so was yours – you should be so proud of what your body is able to do for you! Hugs!